The view from Sonoma Mountain ripples with layers. Up close, there are rolling hills of grass, mostly in shades of brown this early in the fall. A few green shoots peek through in response to the first true rain of the season. Stands of mature oak trees are dotted about, with younger upstarts sprinkled among occasional clumps of speckled gray boulders that appear almost curated in their pleasing placement. Roads and fences are evident but unobtrusive, hugging the rolling landscape in patterns that mimic nature’s curves. As one’s gaze moves to the middle distance and the great beyond, drinking in the vista soothes the soul and quiets the mind. A turkey vulture wheels and dips through the air, its vast wingspan and outstretched primary feathers spread like fingertips. Palmer is passionate about a lot of things: Restorative agriculture. Henry David Thoreau. His wife and baby. Finding a way to make a real difference. But for him, it always comes back to nature. “When you look across this landscape out at the hills, historically — let’s say 15,000, 20,000 years ago — before the Native Americans even got here, there would be crazy amounts of herbivores grazing through those agricultural bottoms shoulder-to-shoulder. They’d all be moving in this amazing symbiosis of basically animals eating, predators chasing them, the animals moving off, and the grass regrowing. Restorative agriculture as manifested by happy cows. For Palmer, the road to Sonoma and his work in restorative agriculture was a bit like riding up the mountain in his pickup truck — bumpy enough to rattle teeth, filled with switchbacks and entry-coded gates. Getting here did not resemble a straight shot. His family moved to the San Francisco Bay Area when Palmer was just a baby. He recalls his childhood with the affectionate hindsight of someone who appreciates his own good fortune. He ended up at the University of San Diego thanks to a few different factors. “My dad did his Navy training in San Diego, so he was partial to the area,” he recalls. “He told me, ‘San Diego is a great place to go to school. It’s got beaches, it’s beautiful.’” It didn’t hurt that Palmer received a substantial academic scholarship and was offered a spot on the football team. Outspoken, blunt and more than occasionally profane, Palmer is particularly clear-eyed, even when (perhaps especially when) he talks about himself. His football career as a tight-end was cut short by a harrowing career-ending back injury at a practice his first year. “I got de-cleated, was about four feet horizontal in the air and landed on my lower back,” he recalls. “I could barely feel my legs for a few minutes.” While football receded in his rear-view mirror, his scholarship carried through all four years, and Palmer looks back on his academic experience with genuine affection. He sees a clear through-line from classroom to what has become his life’s work. “Dennis Clausen was my English professor during the first semester of sophomore year. That led to my classic collegiate awakening: He exposed us to a breadth of different books, but we read excerpts from Henry David Thoreau’s Walden, and that just blew my mind wide open,” he recalls. Another aha moment came in a sociology/criminology class with then-professor A. Rafik Mohamed. After college, Palmer worked jobs to make money to travel. “I got the sense that I was going to find my calling by wandering around backpacking in Europe,” he says. It took a while, but it worked. Over the course of the six months he was bouncing around the continent, he met some guys who were interested in documentary filmmaking and thought that might be a way to help save the planet. He wound up getting a job in Marin at Habitat Media working on documentaries about nature and politics. 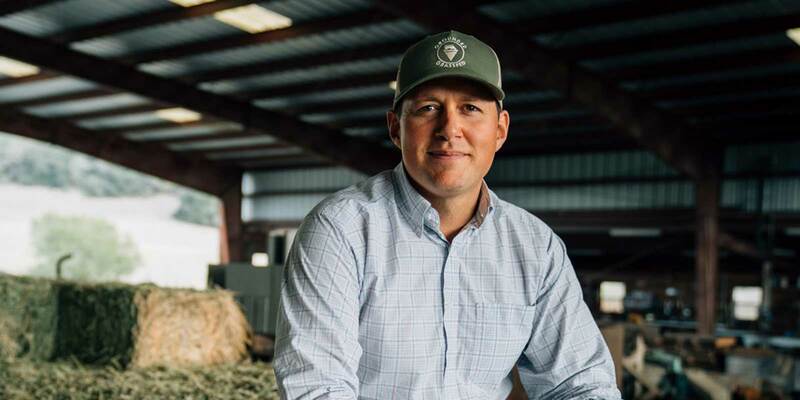 While working on a film about building community and political support around agriculture, Palmer tripped over what would ultimately become his career. Byron Palmer wanted to physically do the work of making the world a better place. He knew he needed to make the political personal. “I was living in Marin and biking out to the 101 and taking the bus to the East Bay.” It was practically a full-time job. Now in his mid-20s, Palmer started taking workshops and visiting and interning at farms. His next stop seems made for its own documentary: “I did an organic farming apprenticeship at The Farm in Tennessee,” which was co-founded by iconic countercultural hippie Stephen Gaskin who worked alongside a few hundred spiritual seekers from the Haight Ashbury district. For Palmer, it all comes back to Thoreau. It’s really about paying attention. Palmer was exactly where he needed to be to get to the next stage. Figuring out how to actually make a living while making a difference is a tricky business, something that Palmer knew from day one. Palmer got busy and cold-called every ranch in Marin and Sonoma counties trying to get hired. The response? Crickets. Fast-forward to today, and Palmer finds himself wearing two professional hats. 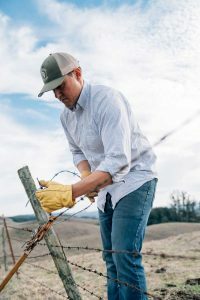 He’s the grassland and cattle manager for the Sonoma Mountain Institute (SMI), a nonprofit that “works to support human beings’ relationship with nature.” He oversees 4,500 acres and about 750 head of strategically placed grazing cattle. It all translates to using integrated methods of soil-building, replanting grasses and trees, water management and providing space for people to get a firsthand experience with nature. Byron Palmer, wife Alyssa and baby Emma are living the dream. Palmer is adamant that this work is important. 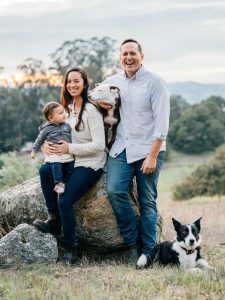 And for those meat eaters who want to feel like they’re making an ethical choice with their dining dollar, Grounded Grassfed aims to let customers make an educated choice about what they feed their family. “It’s super important to be as open and transparent about our process as possible,” he says. 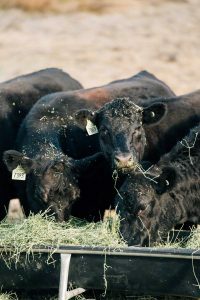 “I want folks to be able to make an informed decision.” His customers can buy anywhere from an eighth share of a cow to a whole cow, and come to the ranch to pick up their meat once a year — after cattle are harvested in their prime, typically in late spring. All this talking makes a person hungry, which is not a problem, as it’s lunchtime. After bouncing along yet another bumpy road, we pull up to the house, where Palmer’s wife, Alessa, is dressing a salad while baby Emma scoots along under the watchful eye of her grandpa and the family’s two dogs. Steaks and burgers are, naturally, part of the family-style lunch buffet. To learn more, go to sonomamountaininstitute.org and groundedgrassfed.com. Photographs by Byron Palmer and Chris Parks.